Tasmania has had a damaging year, with the island state hit by a series of ushfires and floods. 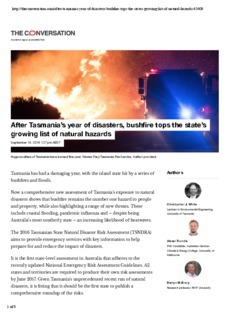 Now a comprehensive new assessment of Tasmania’s exposure to natural disasters shows that bushfire remains the number one hazard to people and property, while also highlighting a range of new threats. These include coastal flooding, pandemic influenza and - despite being Australia’s most southerly state - an increasing likelihood of heatwaves.